The controversial idea of using fuel cells to power data centers has been under discussion for the past couple of years. 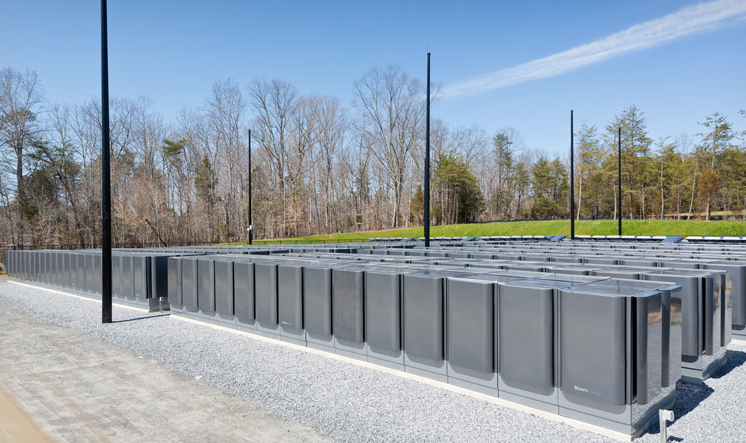 Probably the most famous project out there is Apple’s 10 MW fuel cell farm, which uses 50 fuel cells from Silicon Valley startup Bloom Energy installed next to its east coast data center in North Carolina. But Microsoft is just starting to kick off a pretty unusual and innovative project using fuel cells and data centers that could some day draw a lot of interest. Microsoft is working with young startup Redox Power Systems and using a grant from the Department of Energy’s ARPA-E program, to test out Redox’s fuel cells to power individual server racks within a data center. A Redox Power Systems fuel cell is shown off at the ARPA-E 2015 Summit. For a refresher, fuel cells are devices that take a fuel (usually natural gas or biogas) and oxygen and run these substances through a chemical reaction (using a catalyst and stacks of materials) to create electricity. It’s set up like a battery (with an anode, a cathode and an electrolyte) but it generates energy, instead of storing energy like a battery does. Microsoft’s idea for its new fuel cell project is unusual because most of the limited number of fuel cells that are being used for data centers today — like the ones at Apple’s facility — have been installed in clusters outside of the data center, or in a separate area of the data center, away from the servers. This set up requires conversion infrastructure to convert the DC power from the fuel cell farm into AC power to be pumped into or around the data center, and then converted back into DC power to be used by the servers. Microsoft’s plan is to essentially distribute lots of small fuel cell stacks down at the individual server level, delivering onsite energy, cutting out the conversion infrastructure and eliminating those costs. Without the infrastructure costs, Microsoft could in theory afford to potentially pay higher prices for fuel cells, which despite the best efforts of a handful of companies have long been pretty expensive compared to grid power. Bloom Energy fuel cells at Apple’s data center. Image courtesy of Gigaom. Microsoft has actually been working on this idea, and considering fuel cells in general, for several years. The company wrote a white paper on the fuel-cell-per-rack model over a year and a half ago and already trialled the technology at a test facility at UC Irvine using a proton exchange membrane fuel cell (or PEM). Microsoft is also trialling fuel cells, powered by biogas, at a test data center in Cheyenne, Wyoming, which turned on late last year. But even with the company’s fuel-cell-per-rack idea, fuel cells, in general, still seemed too expensive for Microsoft to deploy at a large scale, beyond a small pilot, explained Microsoft’s Director of Energy Strategy Brian Janous. It’s been “frustrating” trying to figure out how to scale fuel cells into something “material for us,” in the tens of megawatts scale, Janous told me. It wasn’t until Microsoft connected with the Department of Energy’s ARPA-E program, and its low-cost fuel cell project — called REBELS for Reliable Electricity Based on Electrochemical Systems — that the Internet company saw there might be some early stage technology that could deliver a more dramatic cost reduction than was currently available on the market. A fuel cell from Redox Power Systems shown off at the ARPA-E Summit 2015. Redox’s core innovation is using nanotechnology to create a composition of ceramics materials for a solid oxide fuel cell, developed over the years by scientist and founder Eric ­Wachsman, who’s the director of the Energy Research Center at the University of Maryland (you can read more of the tech details and patents here). Janous said Microsoft will be getting the first fuel cell stacks from Redox in the Fall of 2015, and will start “kicking the tires” on it then. If the tech operates as advertised, and the startup meets its milestones, the three-year, $5 million project will scale up the system and evaluate how it operates with the servers. At the ARPA-E Summit last week I got a chance to see one of the 25 kw Redox fuel cell units on the showcase floor. The metallic compact box, filled with the fuel cell’s stacks that do the chemical electricity creation, has been designed with a glowing green string of neon lights and cubes. It looks like something you’d see in Tron. Microsoft is also working with other fuel cell makers that are a little farther along on the path to commercialization on this idea, but declined to name the companies. Earlier this month Microsoft showed off a proof of concept that a server can be run off of DC power of a fuel cell. In this way, Microsoft is playing an important role, helping act as a commercialization partner for early stage startups. And if those innovations pan out, Microsoft will be the first company to benefit from them, potentially giving it a competitive edge. Such a pity no fuel cells on renewable energy are involved; this keeps clients behind the NG-meter while still produce CO. If they avoid the ~$10/watt install costs, subsidy and excessive debt financing dependance, and coking issues/stack rebuild costs that are CRUSHING Bloom, they should do just fine. I eagerly await their first product rollout. I looked at this a few years ago as part of product planning. It is highly doubtful data centers will plumb natural gas into data center racks and exhaust out. There are safety specifications for fuel cells for a reason. They are exothermic, working against your PUE. They are far from economically feasible for continuous operation and it takes work for them to be load following. Aren’t they trading one infrastructural cost for another? In this case, you are replacing electrical with fuel that must be distributed to each local fuel cell…the energy has to come from somewhere. Every construction effort I have been involved with (Residential and Commercial), electrical was a lot easier that gas…and a lot safer as well. Of course, I have never dealt with MW scale or AC – DC conversion, so my knowledge is limited in those areas. I like @mkanellos suggestion of creating a DC only infrastructure. I know Facebook has started doing some of this, though they run AC as well. Still, a very exciting advancement. Interesting, but they could also just build DC powered datacenters. GE and ABB have groups that do this. Nextek talks about it quite a bit. it could be a pain in a lot of ways. You’ve have to make sure everything stays on DC power, i.e. take out the AC DC converters in lights, air conditioner motors etc, but it would let you use larger fuel cells instead of server level ones. Then again, MSFT is fairly sophisticated and I live in abject squalor. They must know something.